An epic weekend of music is ahead for fans attending the 14th annual Austin City Limits Music Festival in Austin, Texas, USA – and those of us at home will get the chance to see quite a few of the performances ourselves thanks to the live stream. Each day there is a myriad of incredible performances to choose from – and here are our picks for the first day of the first weekend of the incredible event. Still touring their much acclaimed debut LP, Royal Blood, the UK band are at the top of their game right now – delivering high powered festival sets that are only getting better. We apologise for giving you a clash so early in the day – do try and see half an hour of each! The soul runs strong in Leon Bridges – one of the most exciting emerging acts in the world right now. Don’t miss your chance to see Leon before he becomes one of the biggest acts in the world! Brandon recently treated fans at the Life is Beautiful festival to a surprise Killers reunion. Will he deliver a similar set at ACL? We couldn’t say, but either way his sets have been very well received – it should make for a highlight of the day either way! Because, obviously. 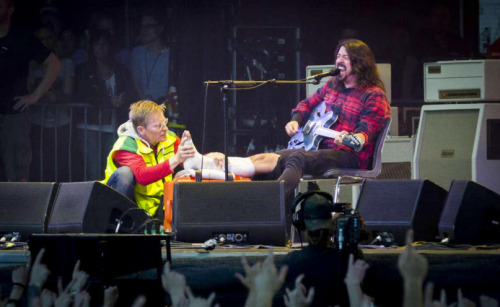 Dave of Thrones on the Broken Leg tour… before he’s out of the cast, don’t miss what is set to be a unique Foo Fighters experience.